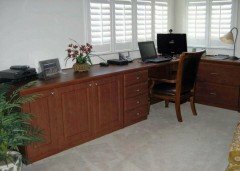 How Much is My Home Office Going to Cost? Last year, I wrote an article entitled “How Much is My Closet Going to Cost”? In that piece, I lamented about the fact that I’m often asked about the cost associated with a closet renovation project prior to establishing the fundamental requirements. Although I don’t often get the “How Much is My Home Office Going to Cost?” question during the initial phone conversation with perspective clients, I thought I would detail some factors that can affect the overall cost of a custom home office. Desk Countertop: The material that is used for the desktop can have a big effect on the overall cost of the project. Pricing for the countertop can vary from as low as $15.00 per square foot to over $100.00 per square foot. Melamine, Formica, SURFX and Granite are all acceptable countertop solutions, each with different price points. Lighting: Unlike the closet, embedded lighting in home office cabinetry is very popular. Lighting for the work surface, lighting in enclosed cabinets to highlight knick-knacks and ceiling accent lighting are all options that one has to think about. Halogen and LED puck lighting as well as strip lighting can be integrated into the cabinetry. In addition, the manner in which these lights are controlled is important. Standard on/off switches, wall switches, motion detection, and dimmer switches can be used to control the lighting. The more complicated the lighting solution, the higher the price. Glass: For shelving or as part of a mullion door, glass is an elegant way to add appeal to the home office. Glass is also very effective for spanning long distances. Used in combination with lighting, glass shelving and glass mullion doors add an upscale flare to the home office. Backing: In hanging upper cabinets, below the desktop and between the desktop and upper cabinets, backing is prominent in office cabinetry. Unlike the closet where backing is rarely seen, backing in the home office is very visible and is often a requirement for structural stability. Whether it be wood toned, cork or mirror backing, the addition of backing can often take the cabinetry to another level. Fluting: Fluting is an accent trim that can be attached to both vertical panels and horizontal shelving. Fluting adds a sophisticated look to the home office. Other: Keyboard slides, cable trays, and pop up electrical outlets are additional accessories that are often incorporated into the home office. Like closets, it’s difficult to be precise about the pricing for a home office without first determining the style (i.e. L-Shaped, Corner, Dual Workstation, Peninsula, etc.) and then addressing all the variables mentioned above. As always, your Closet Tec designer is there to help with the process. 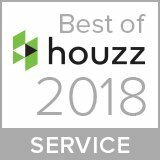 If you’d like to get a free estimate on a custom home office, fill out this form to contact us for a free design consultation.